OMG...yum! If you're a fan of goat cheese, you have GOT to try these easy, quick sandwiches. I'm not sure if this would be considered a breakfast, lunch, or dessert (seriously, I probably could eat one for each meal), because the combination of sweet, savory, and herbal is so unique. Cinnamon-raisin bread is spread with a mixture of soft goat cheese (chevre) and honey (just enough to make it sweet), sprinkled with fresh minced basil (whole leaves would probably work too), and fig preserves (this stuff is absolutely heavenly on its own!). The recipe suggests cooking the sandwiches in a skillet, with a heavy object pressing down on them (a panini pan, for example)...but I just pulled out my trust George Foreman, and it was done (with nice grill marks) within about 3 minutes. 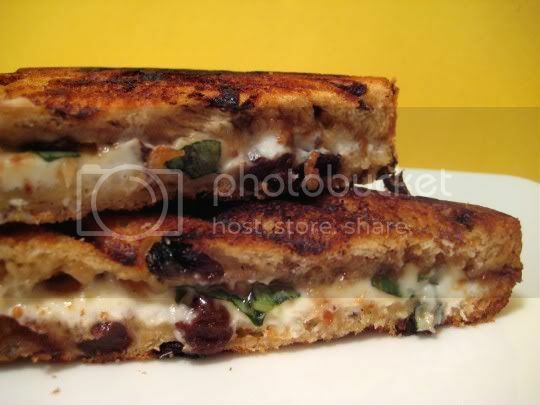 Mmmm, the goat cheese gets gooey and creamy, the fig preserves oozes out with its tangy honey-like flavor, and the basil adds that nice herbal sweetness. The cinnamon-raisin bread adds to the sweetness, which is why I would think this would be more of a dessert or breakfast sandwich. Then again, pair this with a nice tomato soup or herb salad, and you've got yourself a delicious sweet-savory meal. Make again? Hell yeah! Figs and goat cheese could be my new favorite combination. oh wow this looks and sounds amazing.